Pulmonary artery embolism (PE) is a rare and life-threatening complication in the neonate. We describe two previously stable infants who incurred respiratory failure from PE. The first case is a late preterm infant with gastroschisis with autopsy confirmation of PE presumably as a result of a central venous line (CVL) with thromboembolism. The second case is an extreme low birth weight infant with sudden onset of respiratory failure, abnormal chest x-ray, disseminated intravascular coagulation (DIC), and echocardiographic confirmation of a thrombus at the junction of the superior vena cava and right atrium (SVC/RA) at the site of a previous CVL. This infant was successfully managed with thrombolytic therapy and anticoagulation. We suggest that PE be considered in an infant with a history of a CVL who presents with otherwise unexplained respiratory failure. 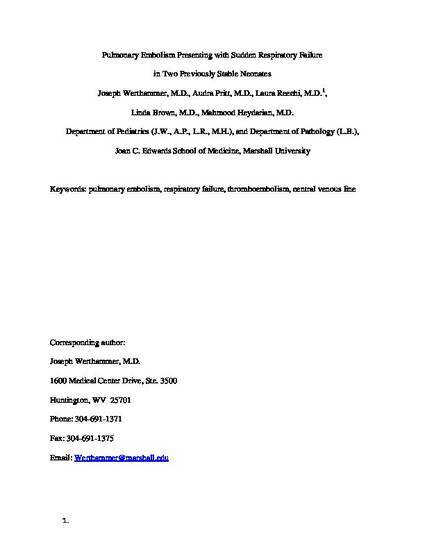 Werthammer J, Pritt A, Reechi, L, Brown L, Heydarian M. Pulmonary embolism presenting with sudden respiratory failure in two previously stable neonates. J Neonatal-Perinatal Med. 2010;3:57–61.